OH DEAR, the dilemma of the dance film, doomed to be a frustrating collection of moving-image illustrations, which are no substitute for seeing dancers in live performances of works in their entirety. This is the case even when the clips are as revelatory as in Nancy Buirski’s Afternoon of a Faun: Tanaquil Le Clercq, a portrait of the legendary dancer who inspired some of George Balanchine’s greatest balletsmade to the measure of her distinctive body and sensibility. Despite their brevity, the film clips and television kinescopes that Buirski selects make one instantly aware of Le Clercq’s mesmerizing presence, style, line, wit, musicality, and joy in dancing. “She’s one of a kind, like a Schiaparelli hat,” said my mom, who nevertheless preferred the more traditional Sadler’s Wells to the modernist abstraction of Balanchine’s New York City Ballet. When I was ten, I saw Michael Powell and Emeric Pressburger’s 1948 The Red Shoes, the ending of which left me with a lifelong phobia of stairs. As a precaution, I deserted the ballet for Martha Graham, and by the time I returned to NYCB, in the late 1950s, Le Clercq was gone. 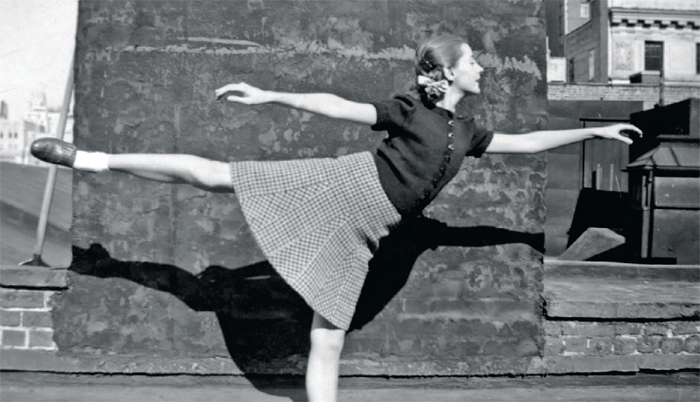 Born in 1929 to a French father and an American mother, Le Clercq was just twelve when she received a scholarship to the School of American Ballet, founded by Balanchine and Lincoln Kirstein in the mid-’30s to train dancers for their future company, the American Ballet, which became the Ballet Society in 1946 and the New York City Ballet two years later. Le Clercq joined the company as a soloist in her midteens and became the focus of Balanchine’s attention. He created more than twenty ballets for her; they married in 1952; then, in 1956, while on tour in Europe, she contracted polio and never walked, much less danced, again. “The tragedy of Tanny,” as Le Clercq’s most frequent dance partner, Jacques D’Amboise, remarks in the film, is “epic, epic.” There are strange coincidences in Le Clercq’s story that suggest, to me, a Cronenbergian construct of body horror. In 1944, Balanchine was invited to choreograph a dance for a March of Dimes benefit. He chose Le Clercq to dance the role of Victim, and he himself danced the part of Polio. No footage exists of that performance, but a few years later, Balanchine choreographed La Valse (1951), for her, its Ravel score a dark expression of post–World War I European trauma. Again, Le Clercq played the maiden seduced by “Death” (a not uncommon ballet theme). Buirski makes dramatic use of the footage of La Valse, and several of the film’s commentators characterize as ironic the relationship between these dances and Le Clercq’s career-ending illness. Adding another twist, she waited in line with other members of the company to receive the Salk vaccine before the tour, but at the last minute refused the shot, fearing that the side effects would exhaust her. I cannot help but wonder if her vulnerability to the disease had to do with her imagining it in her body and mind when she danced the Victim twelve years before. Even in clips of less than a minute, one can see that, unlike lesser dancers and actors who put on their various roles like costumes, Le Clercq allowed the choreography to take her over completely. She was as abandoned as she was precise in her dancing. According to the ballet master’s personal assistant Barbara Horgan, who walks a fine line in the film between frankness and discretion, Balanchine, whose Russian Orthodox mysticism was strong, felt guilty about the polio benefit dance. He believed for many years, despite her doctors’ prognosis, that Le Clercq would regain the use of her body below the waistbut although the strength and mobility of her upper body returned, her recovery stopped there. The marriage, which had grown rocky before her illness, enjoyed a rebirth and lasted another ten or so years, until Le Clercq left Balanchine so that he could be free to pursuefutilelyhis last great dancer, Suzanne Farrell. Afternoon of a Faun (the title is taken from the classic ballet that Jerome Robbins who made at least half a dozen dances for her, remade for Le Clercq) is necessarily bifurcated into the periods before and after paralysis. The facts of the narrative are provided by five people: Horgan; D’Amboise; the dancer Patricia McBride Lousada; another NYCB principal, Arthur Mitchell, who founded the Dance Theatre of Harlem and recruited Le Clercq to teach there, which seems to have offered her a second, productive life in the studio; and Randy Bourscheidt, a friend of both Le Clercq and her more capricious confidant, Robbins. Numerous letters between Le Clercq and Robbins are read aloud. Despite the overly girlish inflections of the actress reading Le Clercq’s missives, we can discern the dancer’s wit, candor, and passion about her art and about Balanchine. But it is the clips of Le Clercq in motion and some stunning still photographs that elevate the film. She was very tall, with narrow, seemingly fragile shoulders, and as Maria Tallchief remarked admiringly, “limbs that never finished.” At once angular and fluid, she moved with incomprehensible speed and lightness; her pas battus (steps made with extra beats of the foot) and the tiny twist of her fingers as she extended her arms were as delicate and organic as the flick of a cat’s whiskers. As an actress she had a huge range that encompassed comedy (Western Symphony ), tragedy (La Valse), and pure dance passion (Symphony in C ). She could have been the bridge between Balanchine’s and Merce Cunningham’s particular fusions of modernism and classicism. And most thrillingly, she seems always to have danced inside the music rather than letting it simply support her, as most dancers do today. Indeed, the difference between NYCB then and now is all too obvious when watching Afternoon of a Faun, in which we get a taste of dance genius that leaves us hungryin vainfor more. Afternoon of a Faun: Tanaquil Le Clercq opens February 5 in New York at the Elinor Bunin Monroe Film Center.